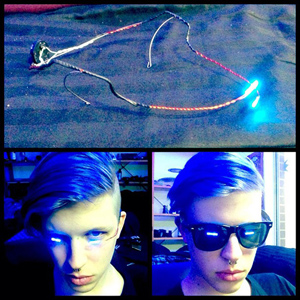 Cyborg Sunglasses #WearableWednesday « Adafruit Industries – Makers, hackers, artists, designers and engineers! 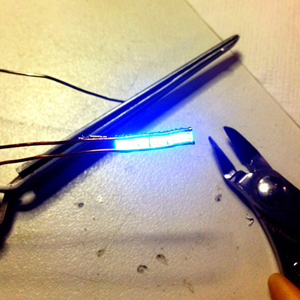 Essentially, this is the core of the situation is SMD LEDs. 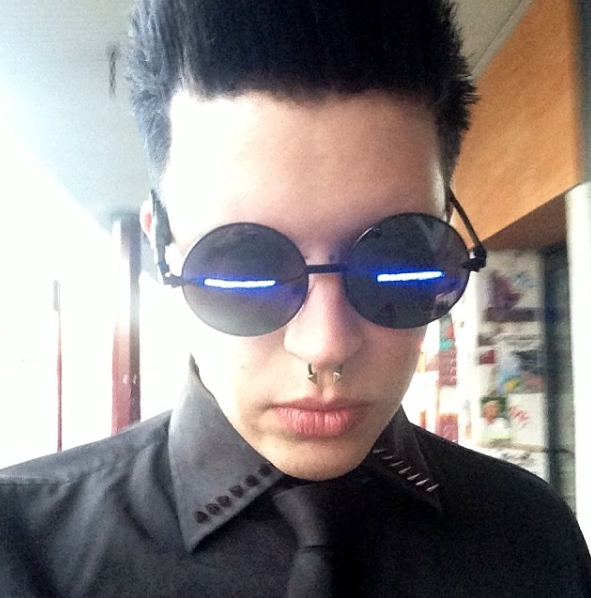 I got two strands of thick enameled copper wire long enough to go from one side of the sunglasses lenses to the other, and allow it to go over the bridge connection. I marked one along its length with a sharpie, and wound them together, except for the two sections that would hold the LED’s. It is important to keep these sections straight. Then, I pinned them down to my work desk with a hard drive magnet (my desk is steel), but otherwise just make sure the whole arrangement is very well secured with something heavy. The difficult part is stripping off the enamel along both of the straight sections, and opening the straight sections enough to allow a 3mm SMD LED to go between. 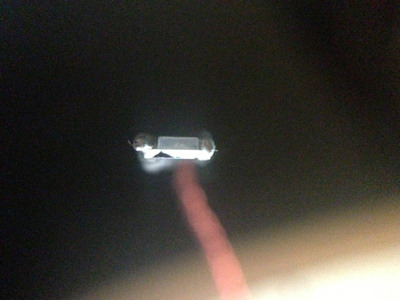 As the LED’s have a raised perspex box, and a flat metal foot underneath, you can use the spring tension of the wires to pinch the block of the LED in place to make it easier to solder. Press them in between the wires, face down. You must have a very steady hand. Put one in, making sure to get the polarity correct from the printing on the back of the LED, and then solder one point then the other. Once you have one in, the others will be easier. You must be careful not to hold the heat to each one too long, as they are going in directly next door to one another, it’s easy to remelt the previous one. Once you’ve done both sides, trim the excess wire off each end. 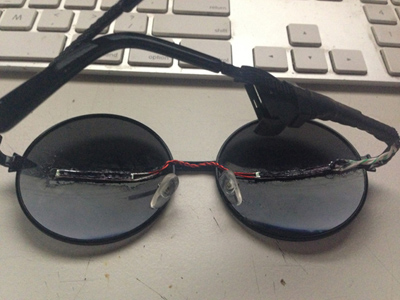 Solder two multistrand insulated wire to one point, enough length to the middle of which ever arm of the sunglasses you prefer to have the battery on. Solder a side mounting CR2032 battery clip to the end, test for duds, bad solders, or LED’s that are the wrong way round. if this is all ok, thread varying sizes of heatshrink onto the end. As you can see in this image, I began with large heatshrink and went down in size over the one before it, to make sure it’s nice and secure, and looks good. Cut two strips of black opaque plastic to glue onto the backs of the led strips, to prevent any stray light annoying your eyes, then glue the strips into place. I also made a version of this that requires no sunglasses, but it is more unwieldy… the benefit is that the bright light seems to be coming right out of your eyes. 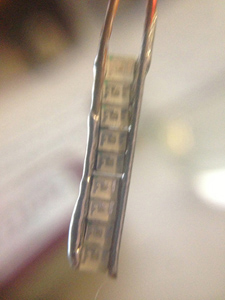 Finally, I did also experiment with the smallest SMD led’s i could find, 1mm. i soldered these onto individual threads of copper from a multicore CAT5 cable. Using these and spirit gum, you can use LED’s as a cosmetics element. 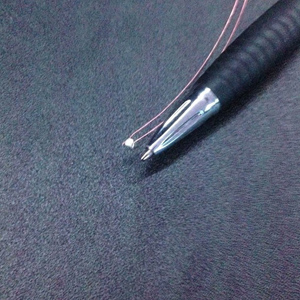 Unfortunately the wire isn’t enameled, so you have to be very careful when gluing it to skin not to cross the wires. One day I’ll actually make sure i’m on my computer for the show and tell, I have a really big project i’ve been wanting to share for ages. Clear nail polish can be used as an enamel.just don’t bend it after it is set.